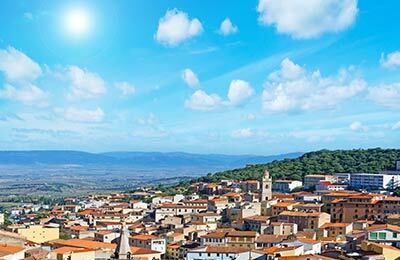 With regular crossings each week to a variety of exciting destinations, Cagliari is a great place to start your journey from. Tirrenia sail to a variety of destinations, including Valencia, Salerno, Arbatax, Palermo, Civitavecchia and Napoli. Below, you can see the departure times for all these ferries and, using the booking form to your left, you can book tickets with AFerry. All Tirrenia Ferries provides a fantastic range of on board facilities. Some of which are luxurious lounges, a central area with panoramic views, bar hall, self service and a la carte restaurants, shopping and entertainment areas. There are also spacious cabins furnished to the highest standards. Casteddu is the Sardinian name for Cagliari which means Castle. The old part of the city is curiously called Castello (Castle - although no castle was ever built there) lies on top of a hill overlooking the Gulf of Cagliari. From here you can see the entire city guarded by the still intact city walls and the white lime stone towers- the Pancras Tower and the Elephant tower built by the Pisans in the 11th century. You can explore the picturesque old part of the city dominated by the beautiful medieval architecture. If you are travelling from Cagliari, visit the largest fish market in Italy famous for the vast variety of fish available for sale to both public and trade. The Gulf of Cagliari also known as the Angels Gulf is aptly called because of the fabulous panoramic views it offers and as an icing on the cake Cagliari has one of the longest beaches in Italy called the Poetto beach which is 13 kms of fine white grained sand. Cagliari is the capital city of the island of Sardinia. 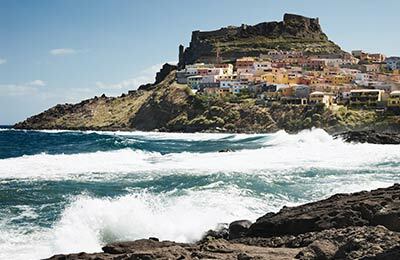 With AFerry, you can book a crossing from Cagliari ferry port to Spain, Sicily, Sardinia and mainland Italy with Tirrenia and Grimaldi Lines. The port of Cagliari is one of the more modern ferry terminals in Italy, and also one of the largest. Therefore Cagliari's port has many facilities to ensure satisfaction, to passengers that have come over from the Mediterranean. Cagliari ferry port is less than a mile from the main city and is well signposted. The Tirrenia ferry terminal is at Molo Sabaudo. With Grimaldi Lines you will also find numerous lounges with comfortable seating, restaurants and bars and children's play areas. Many of the ferries also operate swimming pools in the summer months and on some you can even treat yourself to a luxury spa treatment. Whichever company you choose you will find booking your Cagliari ferry with AFerry simple and straightforward.